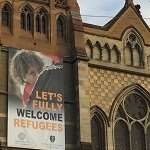 The National Council of Churches in Australia (NCCA) together with the Australian Churches’ Refugee Taskforce (ACRT) call for an end to the demonising of refugees and asylum seekers and a humane approach to their care and support. The media statement outlines a clear call to our politicians and rejects the idea that we face a border protection crisis. “Our Churches and agencies around the nation, as ever, stand ready to help, in partnership with our Government” urges the NCCA and ACRT.